You want fries with your enlightenment? I remember being very fascinated with Unknown Armies. It was a modern, urban horror/mystery game with a very different feel than the World of Darkness. It has a very weird and slightly tounge-in-cheek feel to the rather straight and sombre WoD. And I remember that one of the aspects of the game I thought was really neat was the organisation Mak Attack – a secret cabal, spreading enlightenment by loading up burger meals at the world’s largest fast food franchise with magical energies. Well, lo and behold – here’s a whole book, just about them. The book first describes the cabal, including write-ups (fictional biographies and stats) of many of the movers and shakers. It has some tips for running campaigns with Mak player characters, including some scenario-seeds to use in Mak campaigns. The book also includes new rituals as well as new types of magick and new types of archetypes for the players to play. This includes the Plutophage, who gets power by consuming money or expensive items, and the Anagram Gematrist, who works magic by making anagrams. The book contains a fair bit of fiction, portraying the main players of Mak Attax, and a number of rather disturbing images. In between chapters are often emails or similar, sent between members of Mak Attax. 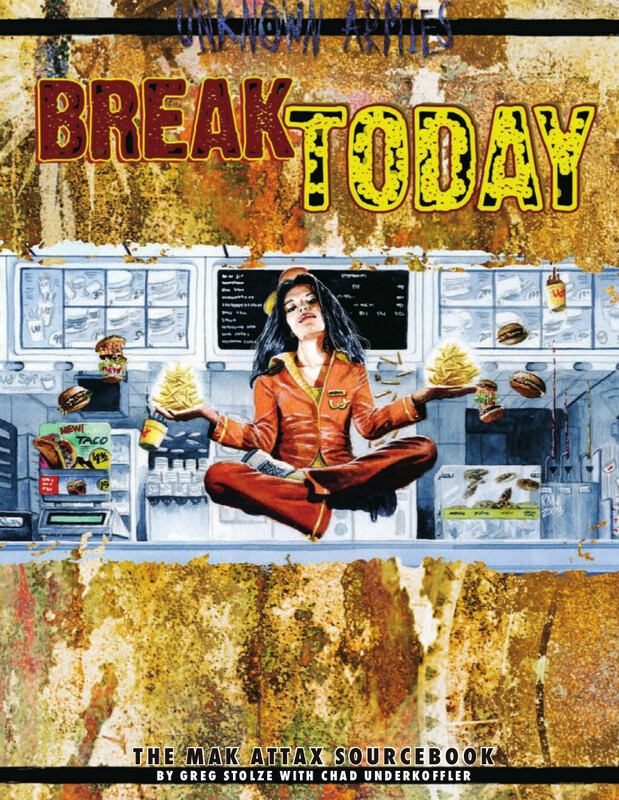 My impression: I like Break Today – it gives a very nice intro into the organisation of Mak Attax, and provides an example of what the world of Unknown Armies should feel like. The book has a lot of details about specific people in the UA world. This means the GM runs the risk of turning the player characters into extras in the story of these movers and shakers in the Mak Attax world. On the other hand, it gives a good impression of the feel of the world of UA, and some neat resources to help you make the world of Mak Attax come alive. A great thing about using Mak Attax is that it gives some more purpose and structure to Unknown Armies. One of my problems with the setting is that I find myself wondering what the goal is for the characters. With Mak Attax, that becomes much more obvious. Not only in that they share the common goal of Mak Attax – it also becomes much easier to develop individual goals that can mesh or conflict with those goals. It provides a great basis for a game where players are each others’ greatest allies – most of the time. At least until one of them has an opportunity to further their own goals, to the possible detriment of the others in her crew. The book has pretty good guides to starting a campaign based on a crew of Attax’ers. There is a lot of background information on Mak crews, and some advice for creating a crew that will play together. I also like the story seeds included. They vary a fair deal, providing stories for many different kinds of games, and all of them seem interesting. They’re not too detailed, but give a good basis for turning it into actual play. On the other hand, I lack guides on creating a cohesive campaign based on Mak Attax. The book suggests stringing the story seeds together into a campaign, but that is not really what I’m after. I would like some hints on creating a campaign with an overarching plot and some good story development. That is mostly absent from the book. 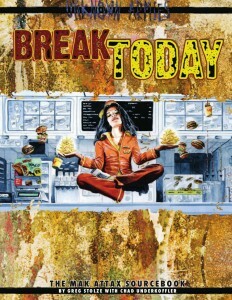 Break Today is a great resource for a game of Unknown Armies, particularly if the premise of using the world’s largest – and probably most controversial – fast food chain as a vehicle for enlightenment strikes you as a fun concept to develop. It could also be a great resource for creating NPCs for a campaign not featuring a crew of Attax’ers.